A spat between gun-maker Daniel Defense and the National Football League is over this pro-gun ad you won't see during this year's Super Bowl. 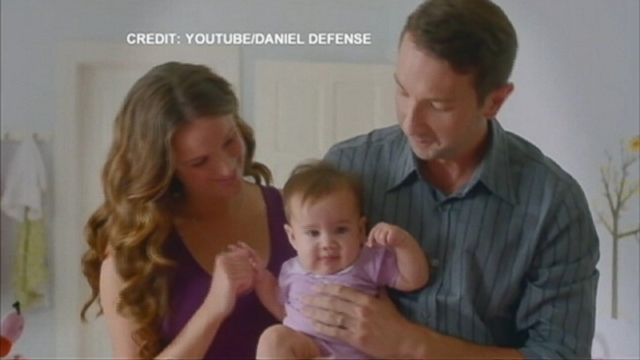 It features a Marine Corps veteran going through his daily life with his family and child. "It's been a long road getting here, and a lot has changed since I got back," he says. "I am responsible for their protection, and no one has the right to tell me how to defend them." "So I've chosen the most effective tool for the job." As the foreboding music plays in the background, you could cut the tension in the ad with a knife. It almost comes as a surprise when at the end, no masked intruder appears. You see only an image of Daniel Defense's signature rifle and this tag line: "Daniel Defense, defending the nation, defending your home." The argument over why this ad won't make it to the airwaves goes like this: Daniel Defense attempted to buy Super Bowl ad time in several local media markets in November. Most of the markets did not accept it and the response from one station in Little Rock, Ark., is still pending. A Fox Station in their home state Atlanta, Ga., told Daniel Defense in an email, "Unfortunately we cannot accept your commercial spots in Football / Super Bowl due to the rules the NFL itself has set into place for your companies [sic] category." The NFL says that it never saw the ad and never heard of it before it blew up in conservative media circles last month. The NFL's Vice President for Communications Brian McCarthy told ABC News that the controversy is being ginned up by the company who was "looking to gain exposure for this ad." The league's guidelines prohibit ads with "Firearms, ammunition or other weapons; however, stores that sell firearms and ammunitions (e.g., outdoor stores and camping stores) will be permitted, provided they sell other products and the ads do not mention firearms, ammunition or other weapons." The ads' creator, and Daniel Defense's Director of Marketing Jordan Hunter said the company did everything it could to bring the ad within the NFL's guidelines. It never shows guns or ammunition, and Daniel Defense says their company is like any other sporting goods store in that they have storefronts that sell other things like T-shirts, knives and outdoorsman paraphernalia. Hunter is a former Marine who partly inspired the ads subject. The actor who was cast to play the husband in the ad was a Marine reservist. "I made the commercial and it is based on real life," Hunter said. "I served in the Marine Corps, I got out, I've got a daughter and I've got a family." "It relates to so many veterans and so many gun owners in this country," he said. The ad has been watched millions of times on YouTube and the story has taken Daniel Defense's claims from the blogosphere to the 24-hour cable news networks. It follows a long tradition of "too-controversial-for-the-super-bowl" ads that gain a viral following online, without the company having to spend a dime on expensive Super Bowl time. Yet it is this country's difficult year with gun violence that has made the issue even more sensitive. After the Sandy Hook Elementary School massacre, there has been a seemingly unending stream of school, mall and workplace shootings. Hunter acknowledged that emotions are still raw. "We understand that some very real things have happened this year… people with mental health issues have done some very real things," Hunter says. But he said the ad wasn't just publicity for the company. It was also about voicing support for the Second Amendment. "This was a branding thing for Daniel Defense definitely but we wanted to create an ad that was a constitutional ad," he said.